I was 20 years old when Patti Smith’s album “Horses” came out. If you walked into a hip record store back then and heard that album playing, you knew that the world had made a seismic shift. Just Kids is the kind of book that is nice to have around. More than a page-turner, it’s the kind of book that’s nice to pick up again, to be once again inspired by. You want to savor it, not try and soak it all up in one go. 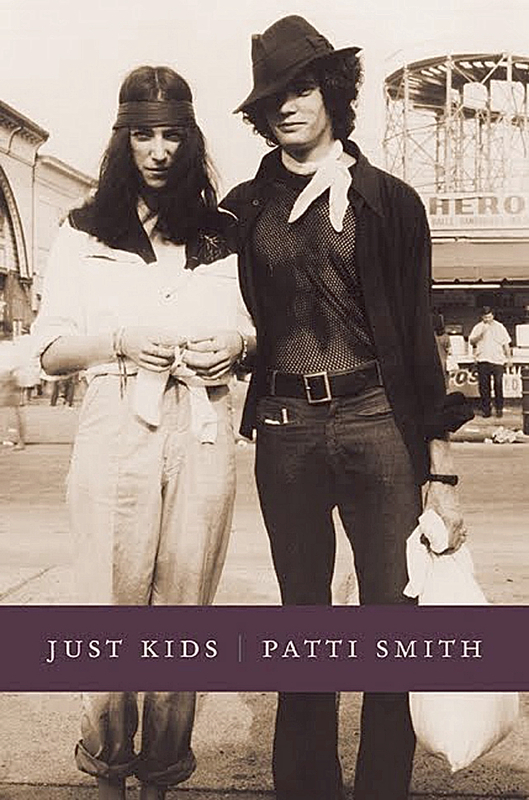 Patti is detailed about her influences, for example – a nice quality in any biography. Her story is thus imbued with layers of meaning, showing intention. Yet there is space within it in which to imagine one’s own interpretations. It works very simply – it is good storytelling. She tells of the close personal, creative and spiritual collaboration she shared with Robert Maplethorpe; of their ongoing dialogue. It was/is timeless. No one can speak of Maplethorpe’s work with more authority – their story seems essentially and inextricably linked. It is at times a very plain, simple story of poverty and struggling to get by. Humble, waif-like beginnings, humility; and deep within the core of that, an essential understanding, confidence and belief in one’s self. Simple, aesthetic pleasures – aren’t they the best kind? Choices had to be made about money: food or art materials? Holding struggle sacred, as a part of artistic process; or alternatively, simply stating the reality of the way that it was. She makes that kind of commitment to art seem attractive and noble. The value of having a muse, of collaboration. One is struck by the belief that they had in themselves, and in each other; how their combined vision gave them strength and maturity. She doesn’t candy coat or glamorize anything. She doesn’t need to – she was there. I liked her everyman/common man sensibility. I like her perception and insight into Robert Maplethorpe’s early work – how it portrayed male gay sexuality in an entirely new aesthetic – with a simple, factual plain dignity. Her narrative voice – her eye for detail, the movement of time and discernment of what’s important – makes herstory engaging. She shares her artistic process and struggles. One gets a sense of integrity, spirituality and honor. It’s nice to learn the many sources of her inspiration and vision. As autobiographies go – indeed, biographies – this one is a gem. It is good that she’s been able to share this story with us. It’s not something that’s easy to do. It takes a big heart – love, understanding and wisdom.